Arepa & Chicharrón! 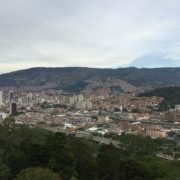 A Weekend Trip to Medellín, Colombia! 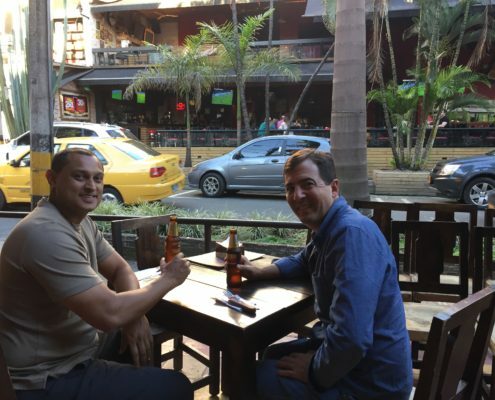 In October of 2016, me and my buddy Adam took a flight from Ft. Lauderdale, Florida for an adventure weekend in Medellin, Colombia. The relatively short 3.5-hour nonstop flight was uneventful. 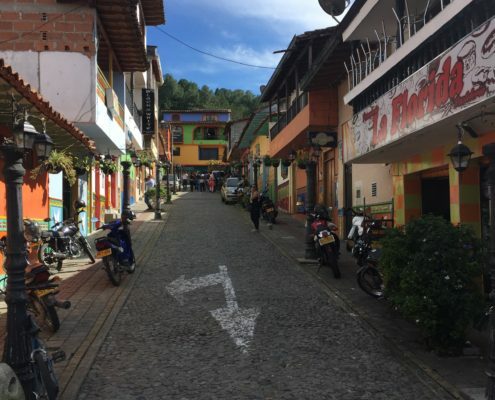 At the airport in Medellín we headed over to the “Yellow Cab” kiosk and hired a taxi to take us on the 40-minute drive to our hotel a couple blocks from Parque Lleras, the main part of town bustling with music, tourists, restaurants, bars and night clubs. Unexplored parts of Amazon Jungle (https://adventurephysics.com/downloads/5-rotation-rolling-torque-angular-momentum/) cuts through Colombia, where not even the locals, or anyone else, has been known to venture. We kept with that tradition and stuck with visiting the more accessible (and relatively safer) local regions. The first order of business, however, was to stave off dehydration and replenish lost liquids with the local brew! Although not very famous for its beer, there are indeed some fine craft beers to savor. The local brew! Adam (in the blue shirt) knocked back quite a few. The food on the other hand should be considered world famous! Arepas, Chicharrón, Ajiaco, Empenadas and Churros were never more than a few steps away and quite inexpensive. 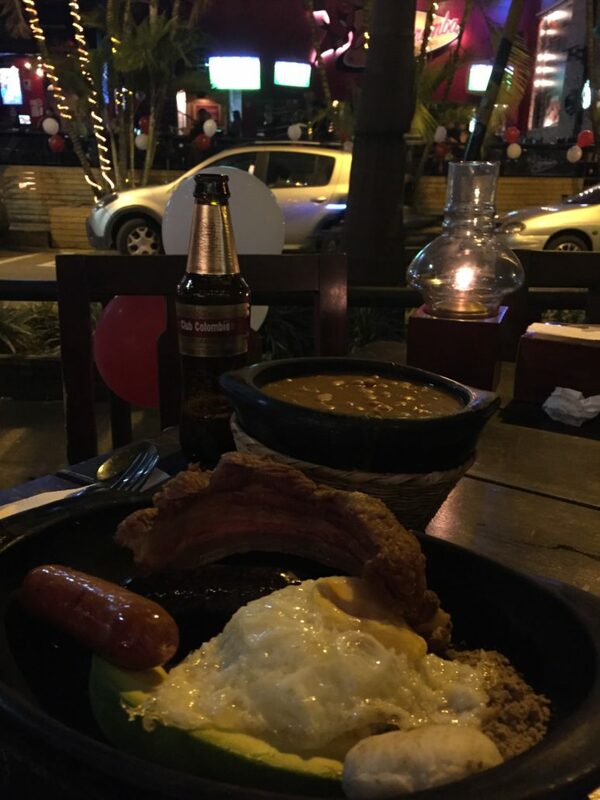 The Bandeja Paisa is a must – a traditional dish of white rice, pork rind (chicharon), red beans, shredded meat, a fried egg, plantains, avocado and arepas. Needless to say, you should bring your stretchy pants…or no pants at all! 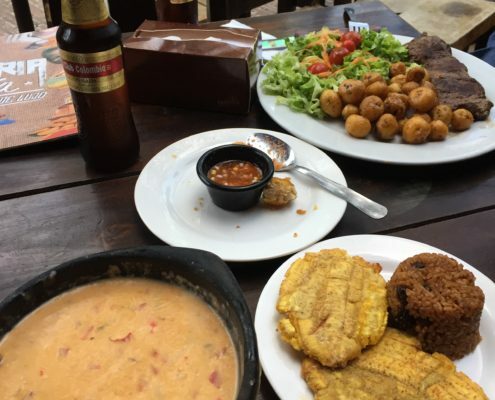 Medellin gastronomy 101. I ate every single thing seen here. It was good. That chicken laid some delicious eggs! 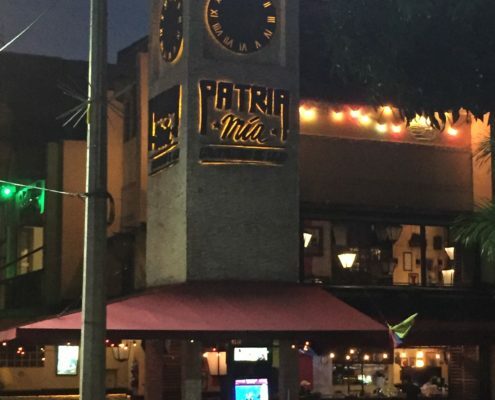 One of the fav food stops was Patria Mia. A large restaurant with all the local dishes available at very reasonable prices. 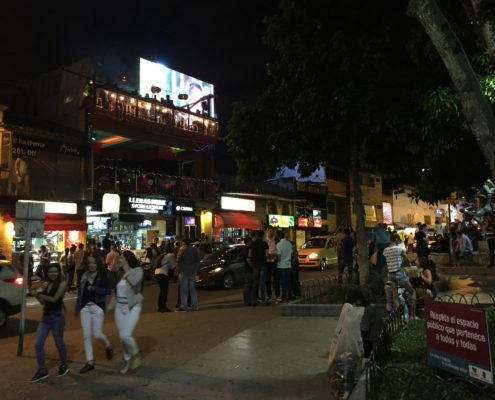 The restaurant overlooks the main town square in Parque Lleras, so there was no shortage of people-watching while dining. Patria Mia is a fantastic restaurant overlooking the main square. Great eats! 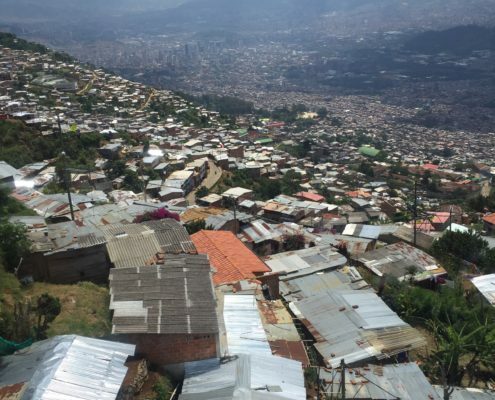 Discovering downtown Medellin on a local bus was a trip and a half. 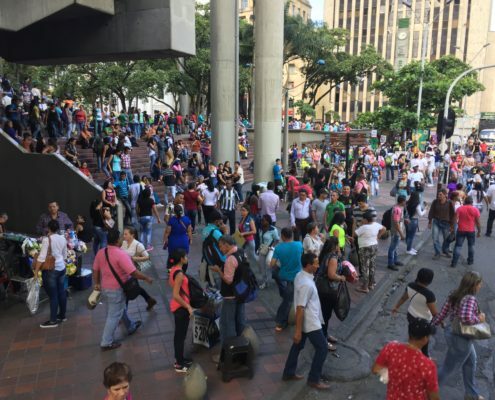 They say the population of Medellin is 2.5 million, and I think I saw every last one of them walking through the streets and selling in the local markets. The shopping itself seemed to offer a lot of locally-made goods. Street market vendors are generally quite friendly and helpful. They’re always ready to negotiate a good bargain. Negotiating a deal on bracelets. 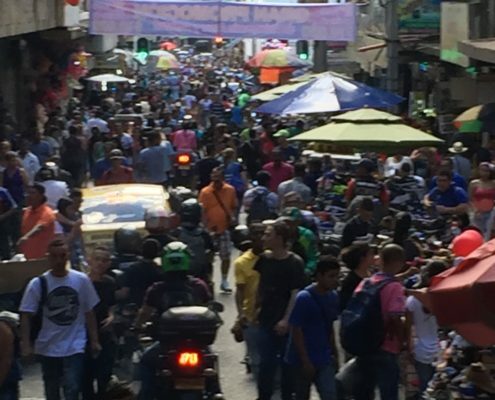 Just a typical day on the streets of Medellin. 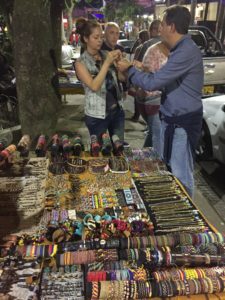 All of our evenings were spent hanging around outdoors at Parque Lleras. The cool air made it relaxing and enjoyable. Lots of people, music, food and drinks made for a lot of fun. The city certainly had a lively vibe to it, and we always felt safe. The locals and tourists alike were friendly and helpful with suggestions for areas of entertainment. 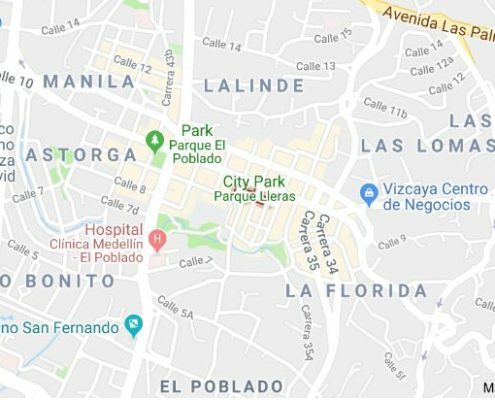 Parque Lleras is the main area of town for entertainment. Adam and I took a couple of day trips outside of the city. 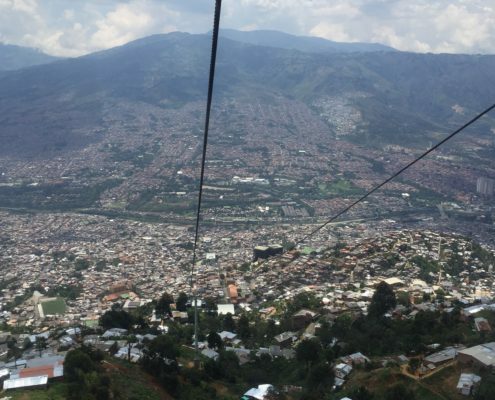 One was taking the local train to just outside of town for a tour on the Metrocable gondola lift system. 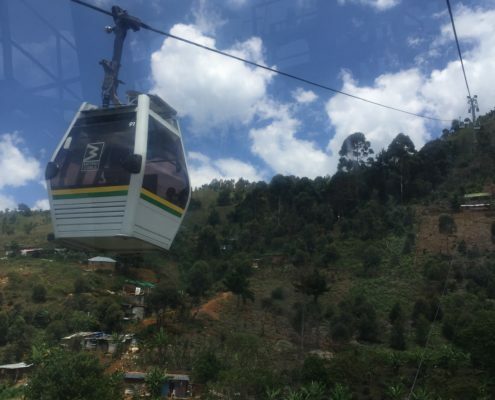 For the affordable cost of 5,200 Colombian pesos (US$2), a rider can purchase a lift ticket on the Metrocable. There are 4 cable lines (Lines H,K,J and L) going to different areas. We took Line L to Parque Arvi located at an elevation of 2,000 m (6,600 feet). The gondola used for the Metrocable system. Quite a comfortable ride. The gondolas offer a fun ride. It moves slowly so there’s no chance of sickness. The gondolas offer fantastic scenery of the mountain villages. At the top of the ride, Parque Arvi offers stunning vista views and hiking trails. There’s a sheltered conference center for weddings and meetings, shopping vendors and a restroom. There are also local food vendors. Maybe no more than a couple of hours are needed to explore the top, and that includes a few of the short hiking trails. 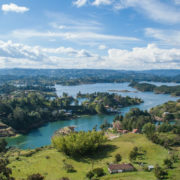 The second day trip was to the very touristy but scenic lake region of Guatape. The local bus from the station in Medellin was just about free, and was supposed to be about a 2-hour ride. But, what they failed to mention was that the “commercial” bus that seats (legally) about 12 people, stops every 30 seconds to pick up a local carrying everything from a goat to a small airplane engine. Standing room only quickly became a joke of an understatement. It was just about all fun, though. Many new and very close friends were to be made on the 6-hour journey (with the 15,000 additional stops). Once finally there, it was very clear that the small town catered mostly for tourists. There were numerous restaurants, bars and small stores that lined the mostly cobble-stone streets. Small streets are lined with restaurants, bars and shopping. 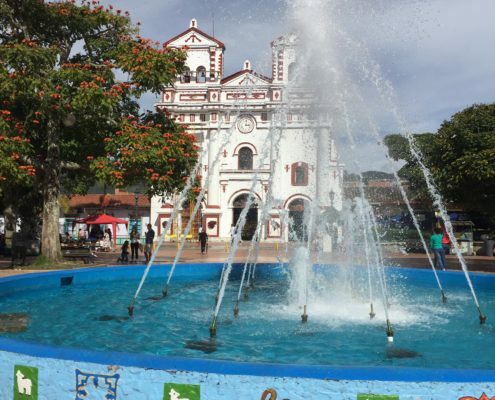 A scenic walking town with old churches and other historic buildings. Besides milling about town, there’s zip lining, hiking, biking and boating available. 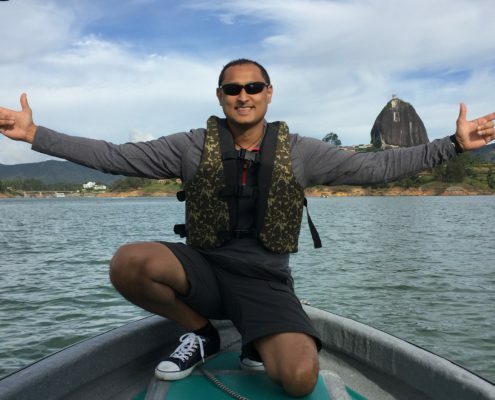 We rented a boat for a nominal fee and explored the easily navigable waterways. I suspect there were fishes in there somewhere as well. 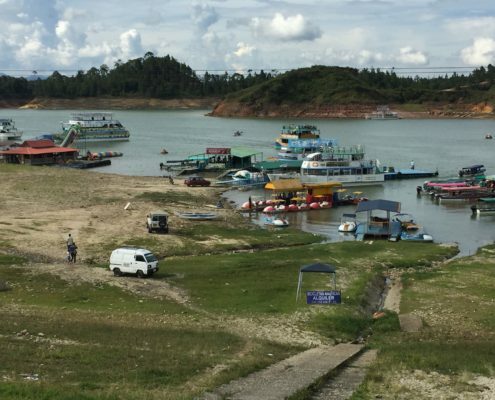 There are many lakes surrounded by scenic hills and lush countryside. 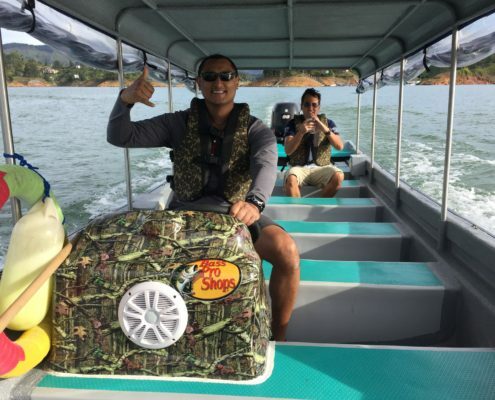 Boat for hire! I snagged one passenger, who didn’t pay. Thanks, Adam. There’s that really big iconic rock off in the distance that can be climbed. The bus ride back to the hotel was even more eventful than the ride getting to Guatape. I swore on the first ride that they couldn’t possibly fit one more person on that bus, but I was very, very wrong. A 6-member music band joined us (instruments and all) and got the show on the road, so to speak. Another 4 hours (apparently we took a short cut back to town) slowly went by with multiple strangers taking turns sitting on my lap…for I had a seat that I actually paid for. And no, there was no bathroom on the bus. Just the open window which happened to be…yes, you guessed it, in the row of seats I was sitting on. Boy was that fun! All in all, we had a blast in Colombia and most certainly would return there at the first opportunity. Fun people, fantastic food and some amazing scenery. https://adventurephysics.com/wp-content/uploads/2018/11/Featured-Image.jpeg 2448 3264 greaterexplorer https://adventurephysics.com/wp-content/uploads/2018/08/Adventure-Physics-logo-adjusted-lines-colored-300x225.png greaterexplorer2018-11-21 21:36:272018-11-21 21:53:41Arepa & Chicharrón! 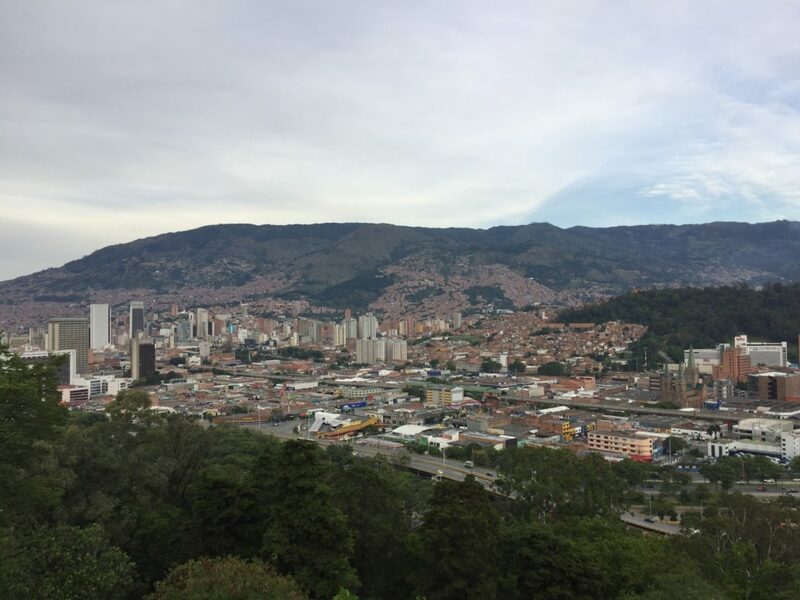 A Weekend Trip to Medellín, Colombia!